Home | STATUES | Giant Charging Titan Triceratops Dinosaur Statue, 245"
Giant Charging Titan Triceratops Dinosaur Statue, 245"
This Jurassic-sized giant with a "three-horned face" has a head so large that it takes up a third of its entire body! 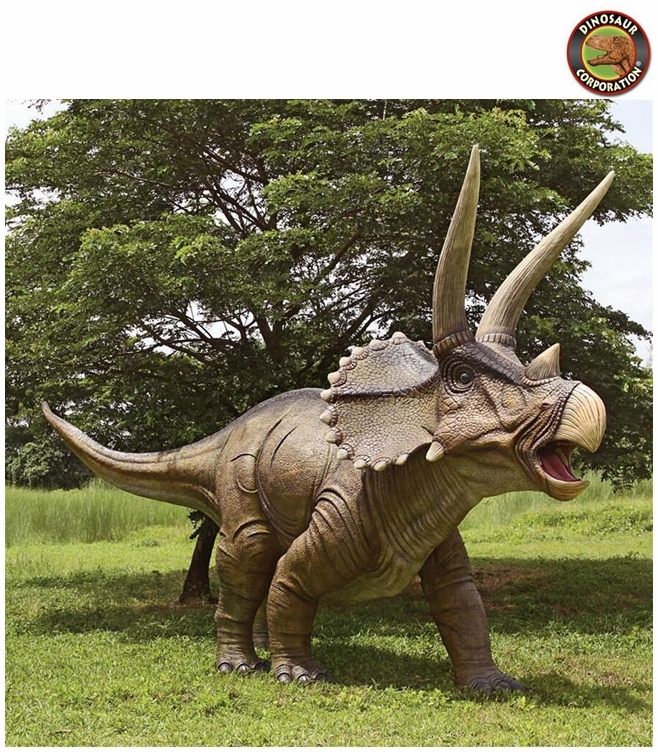 Realistically sculpted with three horns and backward-pointing shield-like frill, our prehistoric replica dinosaur statue is cast in quality designer resin, reinforced with fiberglass for strength and hand-painted with powerfully convincing color and texture to be as faithful as possible to the form of its ancient species. Our Design Toscano-exclusive display-quality giant dinosaur sculpture transforms any home, garden, restaurant or hotel into something truly magnificent! Another breathtaking prehistoric animal statue from Toscano! Design Toscano features a Special Order service; this item will be made to order for you. Due to the size of this item special handling will be required at the time of delivery. Additional shipping charges (other than those stated) may apply depending on the location for delivery. Please contact us directly regarding a delivery quote. * This item is custom made for you at the time of your purchase.